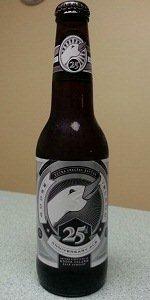 25th Anniversary Ale | Goose Island Beer Co.
Screw the styles, this is a beer that really blurs style lines. It's a very tasty beer that's really hard to put into a box. The toasty and bready malts of an ESB are here, but paired with the level of hops you might expect from an APA. It is similar to an amped-up version of Honkers, but I think the extra hops do more to the flavor profile than that description lets on. A- Pours a rather clear, deep amber hue. Looks like caramel in a glass. A medium, 1.5 finger head forms and retains a good while. The head is frothy and slightly off-white in color. Lacing is average to above. S- Mainly a mix of caramel malts and hops bitterness. The caramel malt is semisweet to the scent. the hops smell is somewhat bitter, but very balanced. T- Starts with a mild hops bitterness on the tongue, then moves toward a slightly balancing malt flavor profile. The malts are mostly caramel and pale in flavor, with a lightly, biscuit-like flavor. The beer's overall flavor is somewhat grainy and hoppy, yet very balanced. M- Smooth and slick across the palate. This beer is middle of the road in carbonation, yet creamy as it goes down. This could sneak up on you from an alcohol perspective, but this is a fairly drinkable beer. Overall, this is among the more enjoyable bitters, mostly given to the solid hop bill. The bitterness is there, but not overpowering and not dominant. The hops and malts blend together very well, providing an enjoyable drinking experience. This was an excellent pub bitter. I was pleased to drink this on a very hot summer day outside on a terrace in the shade. The beer had a slight smell of fresh bread upon opening. The pour was very good into a wide-mouth pint and was deeper amber, the slightly tan head rose nicely and settled back to quarter inch. Very happy with this beer. Let's hope Budweiser doesn't change this beer into something else. I would like to try this from a hand pumped pub cask. I am sure I would enjoy it. Drank 3 slowly and enjoyed. It was as good a little warmer and I could smell the hops and malt drinking it English style 55 degrees. This pours a clear, dark amber color with an average beige head. The aroma is slightly bitter mixed with some malt and grains. The taste is mellow, smooth, and refreshing. It’s a pretty decent quality for a 6pack ESB. There’s nothing all that special about it but it is very drinkable. Poured from a 12 oz. bottle into a Sam Adams "Perfect Pint" glass. Bottled on May 16th, 2013. Appearance: Pours a deep copper amber orange with a lot of rising bubbles. Big three finger off white head with good retention. Leaves a lot of creamy lacing on the glass. Smell: A balanced biscuit malt aroma with solid earthy hop hints and citrus esters. Dry toasty malts with good hints of biscuit, toast, grains, yeast, caramel, toffee, nuts, and crackers. Some tea like hints. Nicely hoppy with good hints of citrus orange marmalade. Earthy hop hints along with some grass. A pretty nice English bitter aroma. Mild but zesty and well balanced. Taste: Like the aroma hints, a biscuity malty taste with a solid earthy and citrus hop presence. Toasted malts upfront with a taste of biscuit, grains, toasted bread, yeast, nuts, caramel, toffee, and crackers. Solid hop balance with a citrus fruit taste of marmalade orange. Earthy hop notes of grass as well. Also some tea like taste. Tastes very English with a nice laid back biscuit malt and hop balance. Solid. Mouthfeel: Light to medium bodied with a moderate level of carbonation. Crisp, creamy and very smooth with a drying finish. Overall: A pretty solid English style Bitter. Has the toasty biscuit and orange citrus flavor typical of the style. 25th Anniversary Ale from Goose Island Beer Co.